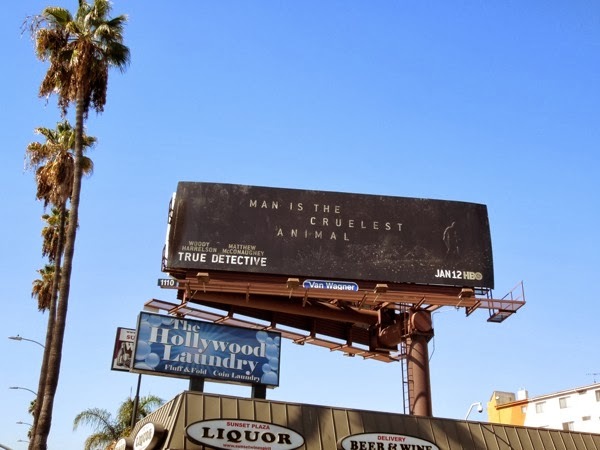 At the end of October HBO started to tease us with these mysterious 'Man is the cruelest animal' billboards for their forthcoming edgy thriller series starring Matthew McConaughey and Woody Harrelson. 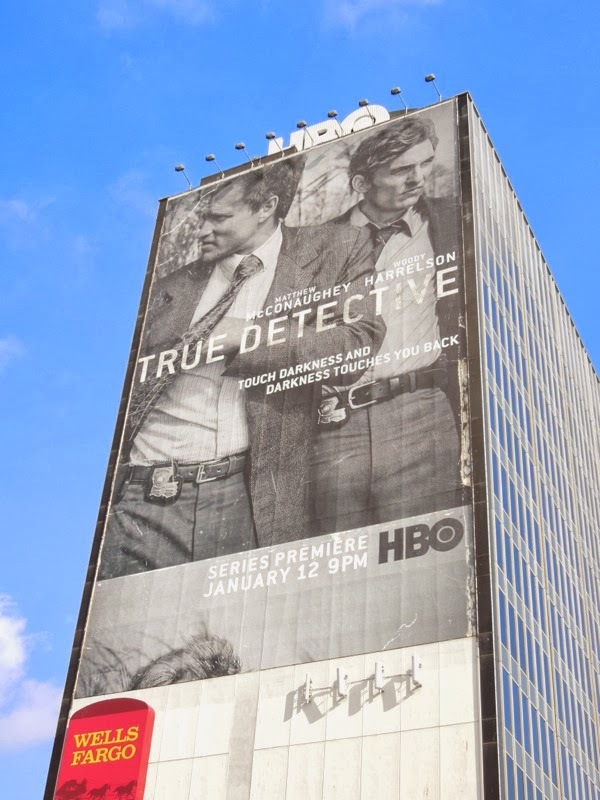 The eight episode series follows the two detectives tracing a serial killer hunt in Louisiana across seventeen years, jumping between multiple timelines to tell the compelling story. 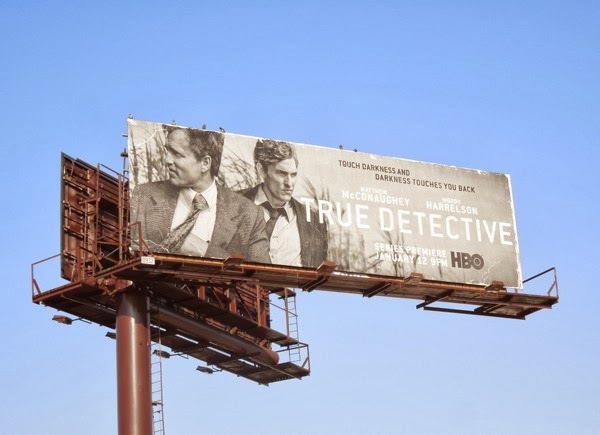 In the dark drama the high-profile actors play former Louisiana State Police Detectives 'Rust Cohle' and 'Martin Hart', who are brought in to revisit a murder case in 2012 they first investigated in 1995. 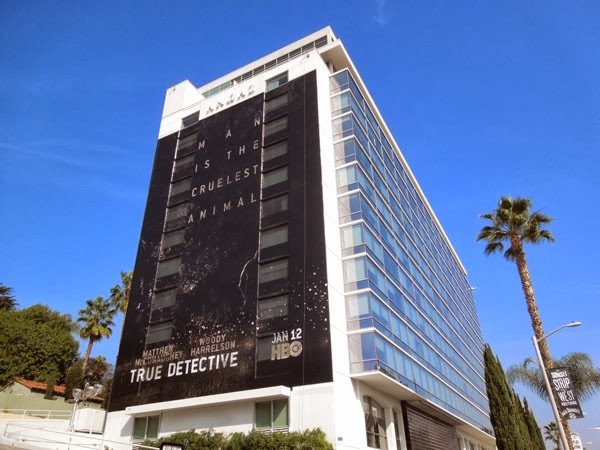 But you shouldn't get too comfortable with these characters, as this new crime procedural anthology series will be similar to the highly successful American Horror Story, where each season will follow fresh new actors, characters and storylines. 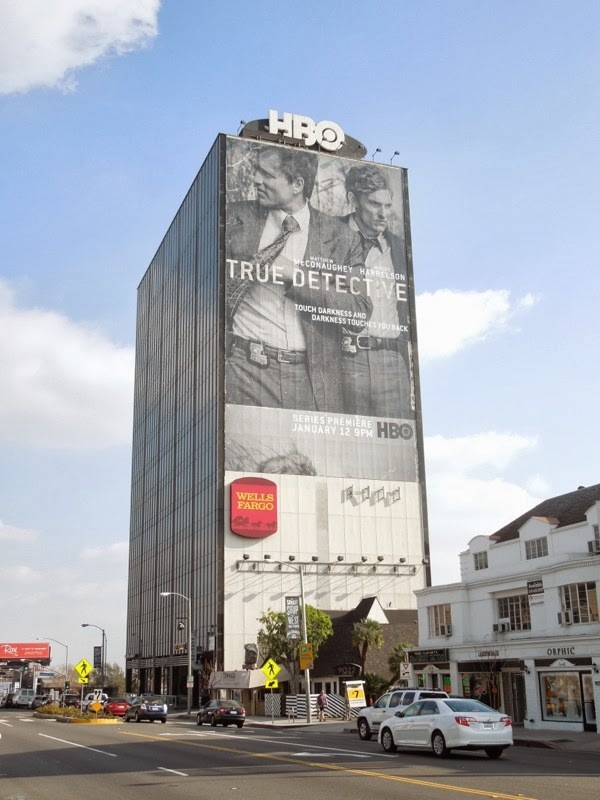 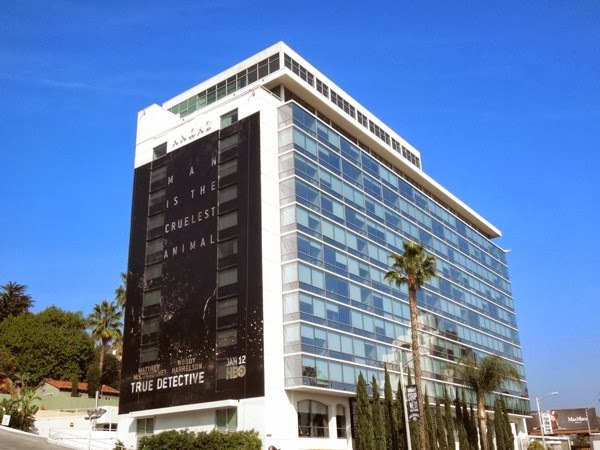 These giant-sized billboards teasing True Detectives were spied along L.A.'s Sunset Strip on October 25, whilst the standard landscape creative was spotted on October 30, 2013 further east along Sunset Boulevard. 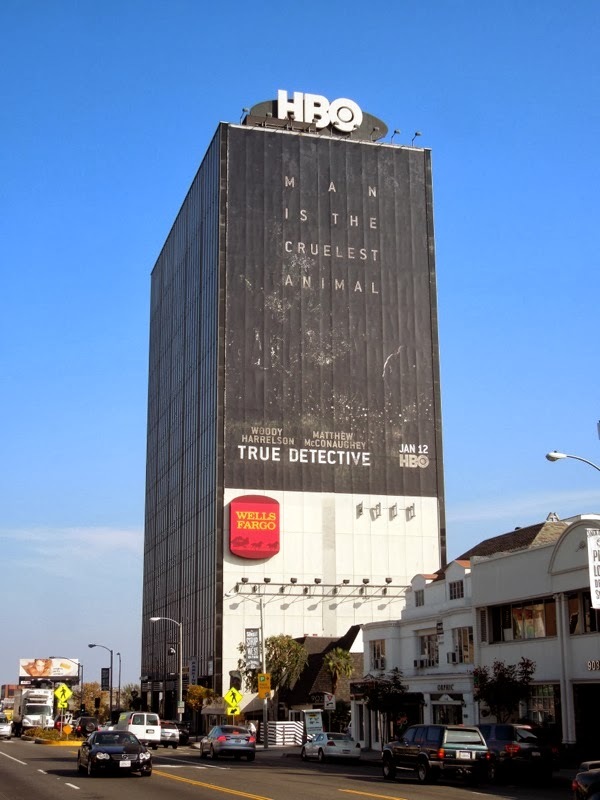 You just know if HBO is doing a crime show, it's going to be gritty, great quality and totally engrossing, so hang onto your hats until January 2014. 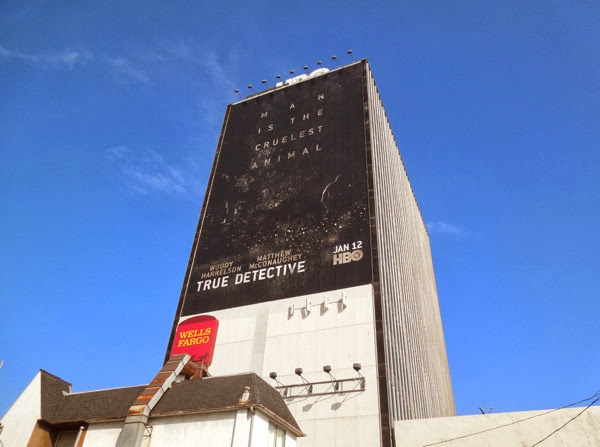 UPDATED: After being teased back in October, you just knew more billboards were on the way for HBO's new crime anthology series, True Detective. 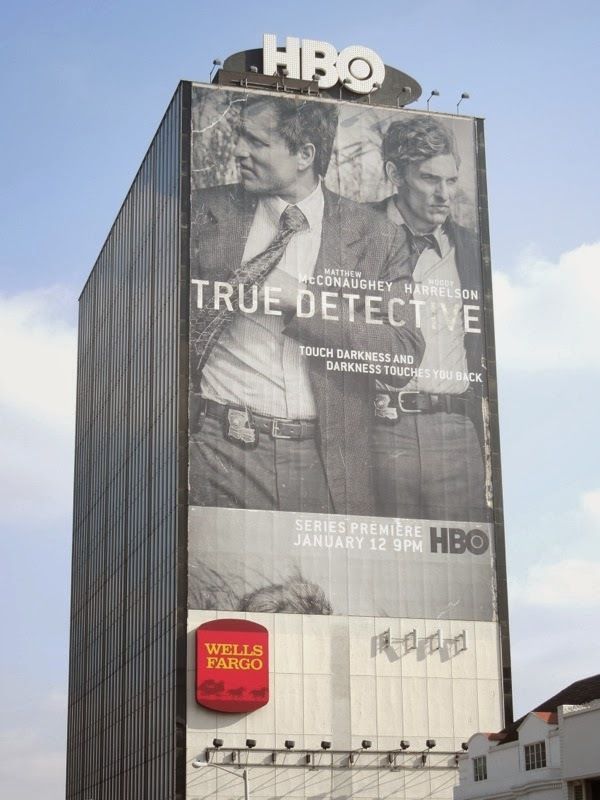 With their long movie history in comedies and rom-coms, it's still hard to imagine this duo as gritty detectives, but after Matthew McConaughey's amazing Golden Globe nominated performance in Dallas Buyers Club and his upcoming role in The Wolf of Wall Street, Daily Billboard is starting to believe it. 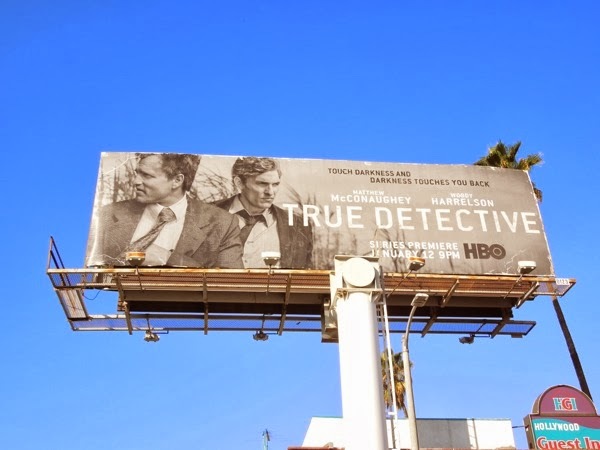 HBO obviously want you to believe it too, as there are billboards for the new crime drama everywhere in L.A. at the moment, like these standard landscape ads snapped along Sunset Boulevard, La Brea Avenue and Pico Boulevard on December 22, 2013. 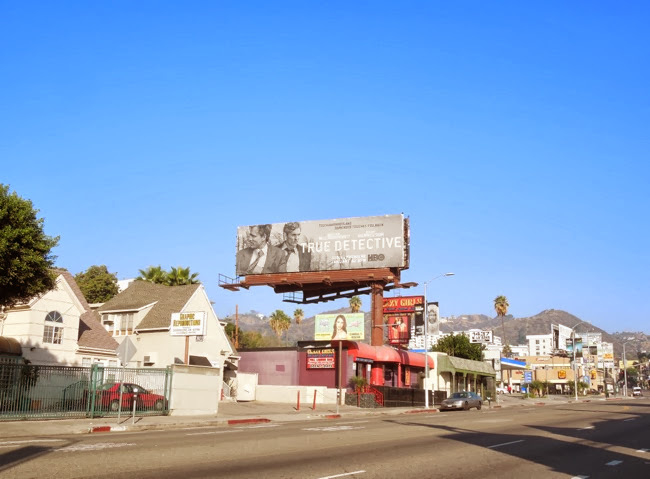 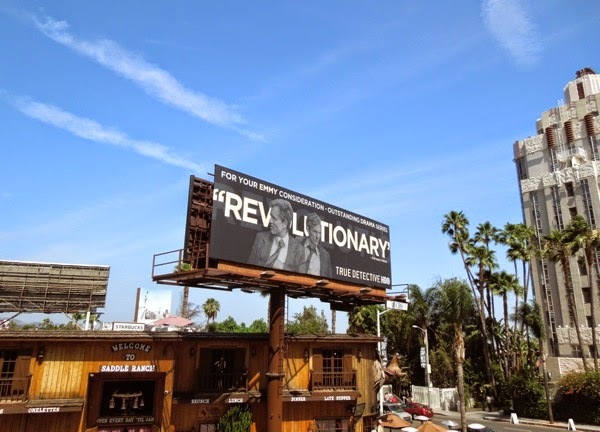 The giant-sized atmospheric mono billboard was photographed towering over L.A.'s busy Sunset Strip on December 21, 2013. 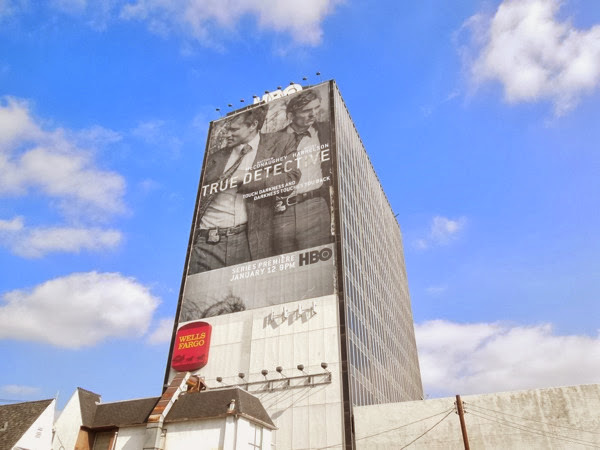 HBO have certainly done a great job of building expectations for the new series with these edgy billboard campaigns, so let's hope it all pays off and True Detective is not a disappointing cop out. 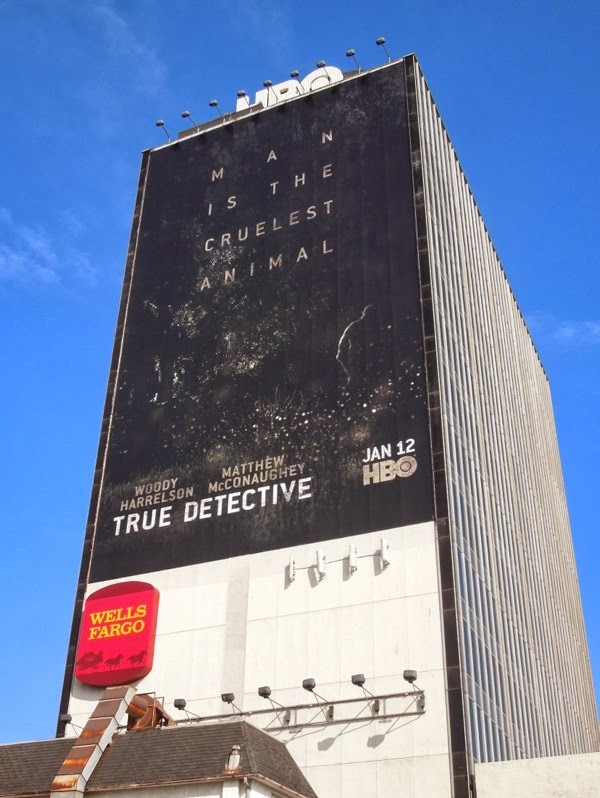 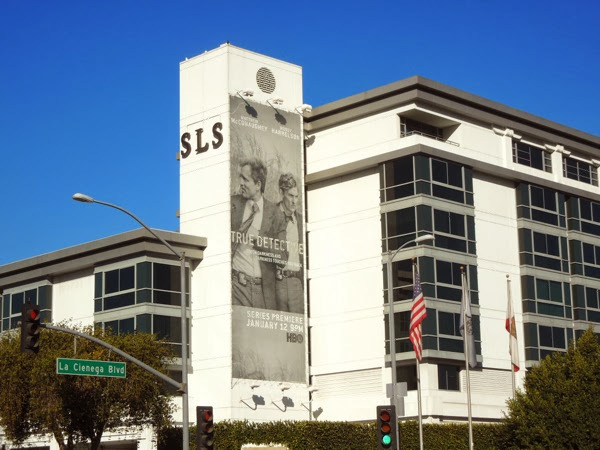 UPDATED: Here's one more vertical style creative for the gritty HBO series spotted on the side of the SLS Hotel at Beverly Hills on January 16, 2014. 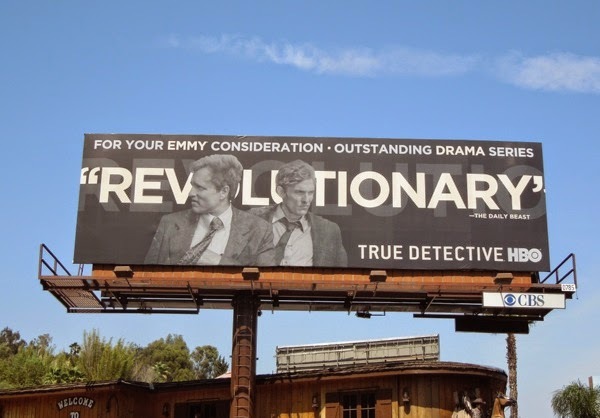 UPDATED: In addition here's the 'Revolutionary' Emmy Consideration billboard for HBO's highly-acclaimed drama series which was spotted along the Sunset Strip on May 19, 2014. 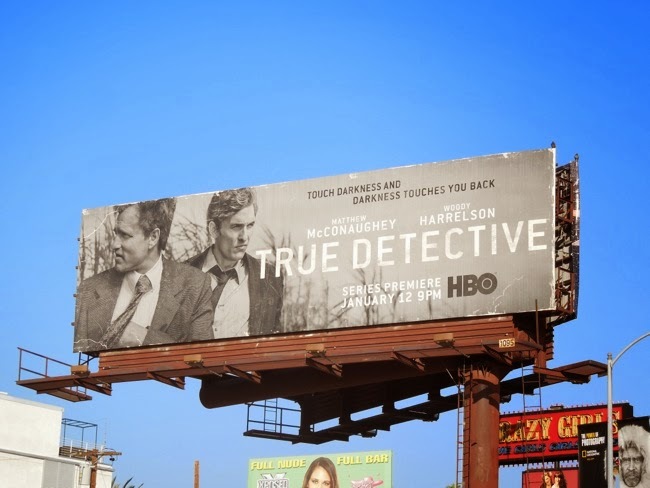 If you like this Emmy nomination garnering billboard for True Detectives, be sure to check out these other fantastic billboards from HBO's 2014 Emmy Consideration campaign.